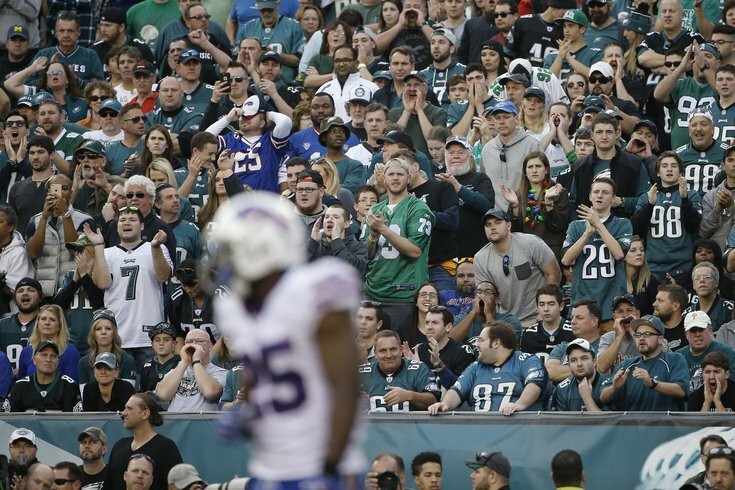 Buffalo Bills running back LeSean McCoy as Philadelphia Eagles fans cheer from the stands at Lincoln Financial Field. One of the big storylines coming into the Philadelphia Eagles game against the Buffalo Bills revolved around the return of LeSean McCoy, the franchise’s all-time leading rusher who was traded in the offseason. And after the Birds' 23-20 win over Buffalo, it appears his former team got the last laugh. Or at least the last word. McCoy, who had plenty to see over the last few days, ran off the field immediately after the game -- ignoring not only his former coach, but his former teammates as well. In the locker room, a massive crowd was gathered around the ex-Eagles' locker before McCoy even arrived. When he finally did, he asked the media to give him a few minutes minutes to dress before he talked. But at some point between when put his gold chain on and threw his backpack over his shoulder, McCoy had a change of heart. "I've got nothing to say," McCoy said. "Excuse me." Most of the conversation leading up the game was generated by McCoy's own mouth — his comments about Chip Kelly, his refusal to shake his hand, and so on — so his quick exit from the locker room was quite a surprise. His personality is, at least, part of the reason there was so much talk about off field issues rather than the impact that McCoy, still in the prime of his career, could have on this important game. And that didn’t change on Sunday at Lincoln Financial Field. It started during pregame warmups, when McCoy and Eagles owner Jeffrey Lurie met on the field for an intimate moment that was caught on camera for all to see, including his scorned former coach. Get a room, guys. Gross. Then came the coin toss, where McCoy got a little help from his new coach, Rex Ryan, who has been known to do a little trolling of his own. Typically, teams send out three captains for the toss. Not Ryan. He sent out just one player — McCoy. The Eagles won the toss as somewhat unwarranted boos rained down from the sellout crowd in South Philly, boos that only got louder when Shady got down on one knee and kissed the logo of his former team at midfield. And then the game started. We can finally start talking about what actually happened out there, right? Wrong. McCoy wasn’t done yet. He exchanged words with Malcolm Jenkins after the Eagles safety wrapped him up for no gain. He also took a shot at Fletcher Cox, which may be one of the more idiotic things you can do. Don’t worry, Cox got his revenge in the fourth quarter. A tackling McCoy for a loss, the big defensive lineman gave him and extra shove to the head and left his former teammate sitting on the turf. Finally, he reportedly shot someone a middle finger just for good measure. If you’re keeping score at home, he was an excessive celebration penalty shy of hitting for the bad behavior cycle. As for his performance on the field, it was far from his best of the season, especially in the second half. McCoy finished with just yards 74 yards on 20 carries, however, 24 of them came on one play and 63 came in the first half. In the fourth quarter, McCoy carried the ball four times for a whopping six yards. He did catch four passes for 35 yards but failed to reach the end zone. Mike Gillislee scored the Bills lone rushing touchdown. As you can see, it was a long afternoon for McCoy, which could explain why he was so quick to hit the showers -- and the road -- following his team's loss to the Eagles.